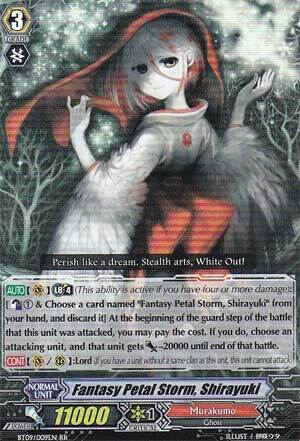 [AUTO] (VC) Limit Break 4 (This ability is active if you have four or more damage):[Counter Blast (1) & Choose a card named "Fantasy Petal Storm, Shirayuki" from your hand, and discard it] At the beginning of the guard step of the battle that this unit was attacked, you may pay the cost. If you do, choose an attacking unit, and that unit gets [Power]-20000 until end of that battle. So we have one of the Limit Break Persona Blasters this week, huh? Personally, I don't have a Murakumo deck, but if I did, I'd definitely use this as one of my aces seeing how it practically turns your dead copies of her in your hand to 20,000 shields. Well, kind of. You see, it's not like a regular shield where it increases your Vanguard's strength. Rather it literally deducts your opponent's Vanguard's power. The reason I am noting this is for the likes of Dragonic Kaiser Vermillion, The Blood and Exculpate the Blaster where they can attack multiple units in one swoop. Since Shirayuki is deducting the actual power of that particular unit, it'll also affect the other threatened units. I personally think it as a super shield because of that kind of potential stopping power that she has. Also, the fact that's its an 11,000 power body shows a lot of potential to be an excellent Dark Horse/anti-meta deck for the upcoming regionals! Starting things off this week, we have Shirayuki. Shirayuki has many things in common with Mandala Lord, but with a few key differences. They have the same stats and a similar defensive skill (more on that in a moment), while their differences include restrictions if a member of another clan is present; -2k for Mandala, and an inability to attack for Shirayuki. Let us talk about the primary skills. For Shirayuki, as a limit break, you can counterblast one and discard a copy of itself to drop an attacking unit’s power by 20k. This is similar to Mandala Lord, whose skill is exactly the same except that the attacker loses only 10k, and isn’t a limit break. So how do we decide which one we want to go with? On the one hand, Shirayuki has a much better late game, when you are more likely to have copies, and a single card acting as a 20k shield is huge. Mandala Lord doesn’t get as big a shield, but you have many supporting units that can add more Mandalas to your hand as the game progresses, making him the more consistent choice. Of course, in a Shirayuki deck, you could use multiples of the grade three search starter to get to extra copies, but you’ll shuffle each time you do; Mandala searches don’t shuffle, so if you miss, you’ll know you have a better chance of seeing one in the next search. At the end of the day, Shirayuki vs Mandala Lord comes down to power vs consistency. Get the skill off less frequently, but have it be game breaking when you do, or more frequently, and basically be running three pseudo-10k guards extra in your deck. Rating: 4/5 – Shirayuki is less searchable, but much more powerful.